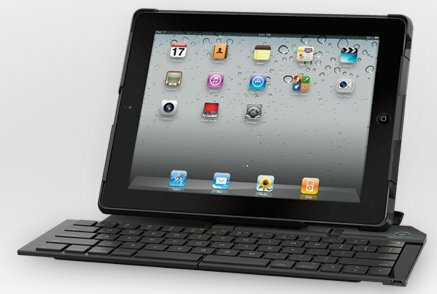 Logitech introduced two accessories for Apple's iPad 2; Joystick and a Fold-Up Keyboard. Today Logitech (SIX: LOGN) (NASDAQ: LOGI) unveiled two new accessories that help you make the most of your tablet. The Logitech® Fold-Up Keyboard for iPad® 2 is the ideal tool for comfy, on-the-go typing, and the Logitech® Joystick for iPad offers more accurate, immersive game play. The Logitech Fold-Up Keyboard for iPad 2 is your perfect on-the-go solution. With a full-size, Bluetooth® keyboard and stand, you simply open and type, and close and forget. Closed, the keyboard rests securely underneath your iPad 2. Open, it holds the tablet at an ideal angle for typing and taking notes. Unlike folio-style Bluetooth keyboards, the Logitech Fold-Up Keyboard for iPad 2 is full-sized for comfy typing. And it charges over USB, so you never need to worry about replacing batteries. The device wakes up and is ready to use as soon as it’s unfolded, and turns itself off automatically when folded to save battery power. The Logitech Fold-Up Keyboard is expected to be available in the U.S. and Europe beginning in September, for a suggested retail price of $129.99 (U.S.). The Logitech Joystick is expected to be available in the U.S. and Europe beginning in September, for a suggested retail price of $19.99 (U.S.).